The most important use of corn is the one that is centuries old. Corn forms masa, the dough for tortillas and their variations and for tamales. Since antiquity, a Mexican table without tortillas is an empty table. According to ancient techniques, dried corn kernels are cooked with water and limestone until the kernel skins are soft. After standing for one day, the kernels are skinned, and the hearts are ground to form masa. Stone mortars and pestles used to do the job. Today, the process is mechanized in all but remote areas. Bring Ingredients to a boil in a large pot. Cook corn kernels over low heat, stirring occasionally, until the skins can be easily removed. Remove from heat and let stand for one day. Skin kernels and discard skins. Wash kernels thoroughly, strain through a sieve, and grind in a hand grinder. Add approximately 1 1/2 cups water and a pinch of salt. Knead until a firm, smooth dough is obtained. Add more water if necessary. To make tortillas, line the base of the tortilla press with a sheet of plastic wrap. Pinch off balls of dough from the masa. Center the masa on the lined tortilla-press base. Cover the masa with a sheet of plastic wrap. Lower the top of the press and push down the handle. Open. The tortilla will have plastic wrap on the bottom. Carefully peel away the plastic on top. Place your hand under the tortilla. Flip the tortilla onto the other hand so the plastic is on top. Carefully peel away the plastic. Flip tortilla onto a preheated, very hot griddle or comal. When the tortilla begins to dry on the edges, flip it over. Cook until the top begins to puff. Tap lightly with your fingertips to allow for even puffing and let cook for 1 1/2 to 2 minutes. Remove tortillas, wrap in a napkin or clean towel, and serve. According to Mayan legend, tortillas were invented by a peasant for his hungry king in ancient times. The first tortillas, which date approximately 10,000 years before Christ, were made of native corn with dried kernel. Today, corn tortillas are made from either corn cooked in a lime-based solution or by using corn flour, producing a dough, forming it like a pancake and finally baking it in an oven. Among native Mexicans, tortillas are also commonly used as eating utensils. In the Old West, "cowpokes" realized the versatility of tortillas and used tortillas filled with meat or other foods as a convenient way to eat around the campfire. Thanks in part to the widespread popularity of Mexican and Southwestern cuisines, Americans love tortillas. In fact, tortillas are more popular today in the U.S. than all other ethnic breads, such as bagels, English muffins and pita bread. In 2000, tortilla sales in the U.S. reached the $4.4 billion mark and are expected to hit $5.7 billion dollars in sales by the year 2002. As testament to their popularity, the Tortilla Industry Association (TIA) estimates that Americans consumed approximately 85 billion tortillas in 2000 (not including tortilla chips). Tortillas have found their place in the American mainstream diet, where they now serve as substitutes for traditional breads in such popular fare as hot dogs, lasagna, pitas, sandwiches and pizza. Tortillas can be used to hold a variety of fillings, used as tasty food scoops, toasted and topped with salad, or served hot and plain. 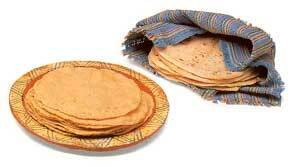 Tortillas are a flat bread made from either corn or wheat. The versatile tortilla can be warmed in the oven, steamed, grilled, fried, heated in a microwave or toaster or baked in the oven.